Today I have another exciting giveaway to share with you! 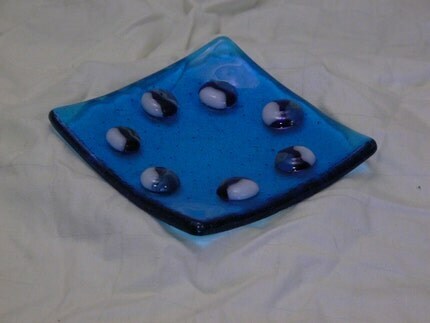 Enjoy meeting Steena from Buddhakittyglass and enter to win one of her fabulous glass trays. Check out her work below and see more at her Etsy shop. I am Steena, owner and artist behind Buddha Kitty Glass. 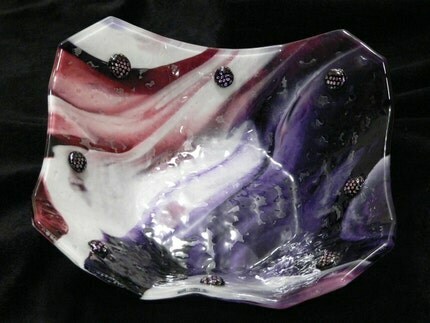 I live in Seattle which is a mecca for glass artists and a great place to create fused glass. Over the years I’ve studied fused glass, cold working glass, lamp working, glass bead making and stained glass at Pratt Fine Art Center in Seattle. My love of glass goes back many years. During a college trip to Europe, I became fascinated with the stained glass in the cathedrals. Upon returning home, I took my first class in glasswork and learned how to make stained glass windows. This served as a wonderful introduction to the world of glass art. From there I began to learn glass bead making and became intrigued by the amazing transformation that takes place in glass once heat is applied. These glass beads became parts of handmade jewelry that I gave to friends and occasionally sold at small craft fairs. A cross-country move and new neighbors served as my introduction to fused glass. My new neighbors in Virginia commented on a glass bead necklace I had made which turned into a discussion about kiln formed glass. My neighbor’s mother taught fused glass. We talked about my fascination with glass she suggested I try one of her mother’s classes. I signed up for her class and was immediately captivated by kiln formed glass. Shortly after the class, I purchased my first small kiln and began perfecting the art of fused glass in my basement in Virginia. After several years, my husband and I decided to relocate back to the Pacific Northwest. 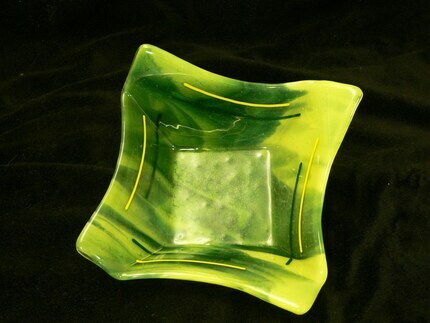 The Seattle area is renowned for its glass art and is a wonderful location to continue to pursue fused glass. I continued my study of fused glass and kiln formed glass at Pratt Fine Art Center. 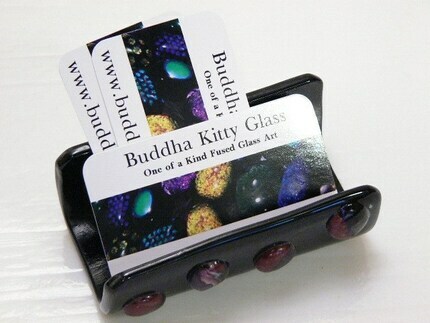 In January 2009, I launched Buddha Kitty Glass. When I am not fusing glass for Buddha Kitty Glass I also serve as a docent at the Museum of Glass, leading tours of the beautiful glass art collections. Being a docent at the Museum of Glass is another way for me to share my enthusiasm for glass art with others. My favorite material to work with is glass! Specifically though I love to make pattern bars of glass, which are thick layers of glass fused together. I then cut them into pieces on a tile saw which reveals the patterns created from stacking the glass. I fuse these pieces into the glass dots seen thought my work. I really enjoy mixing colors together in random patterns in the bars and seeing the amazing results, which come from it. What are your goals for your business? Is Etsy a full or part time job? I would like my shop on Etsy to get so popular that I have to buy a much bigger kiln to keep up with the orders! Seriously, I would really like to have this become my full-time work and eventually have a brick and mortar shop with my glass. A few years back I started trapeze lessons and really love it. I also just bought a canoe and can’t wait to get it out on the water with my family. Besides that I love to travel. I went around the world in 2005 with my husband and would like to do that again in a few years. A friend and I were discussing the art work we made and she told me about Etsy. She wanted to start a shop there but her internet connection was not working properly so I said I would do some research for her and let her know how it worked. After researching the site for her, I decided to start my own. I can’t play favorites it makes the other pieces of glass jealous. Its really been wonderful seeing people react to and enjoy my art. It is great to get to share this with people outside of my friends and family. First you MUST visit Buddhakittyglass on Etsy and leave a comment with your favorite item. Please be sure to include your email adress in your comments or have it visible in your blogger profile. You want to know if you won, right? That's a lot of chances to enter this fabulous giveaway! Giveaway runs through Friday, July 10 at midnight EST. Our winner will be chosen on Saturday morning, July11 via the random.org widget in the right sidebar and will be announced right here on this blog. Winner will be e-mailed and have 48 hours to claim their prize. If winner does not claim their prize a new winner will be chosen. When leaving comments please be sure your e-mail address is available for me to contact you. All photos are courtesy of Buddhakittyglass. There are so many interesting things there and the trays are my favorite item. I had a hard time deciding between blue and green but the Small translucent blue tray with blue and white dots is my favorite. I love the red platter with black dots. That would look lovely on my hall table! I absolutely love your Silver Symphony Sea Glass Pendant Necklace. Every time I visit your shop, I just stare at it. :) Guess I'll have to break down and buy it! i love the Black tray with multi colored dots! so pretty! I love the Black tray with multi colored dots! I love circle pendants and the elegant simplicity of this design is fantastic! I'm a new fan of both oceanside creations and buddhakitty on facebook!